The current global interest in improving the use of ever-scarcer natural resources calls for the re-alignment of supply chain operations to include not only economic factors, but environmental and social factors as well. Two of the most important supply chain activities that logistics managers have to deal with are the planning and improvement of the packing and distribution of products. Although the optimization of these two activities has been thoroughly studied by means of Vehicle Routing Problems and Packing Problems, their analysis is often done separately and, in most cases, they consider only the economic decisions. Independent optimization of these two operations may overlook the structural dependencies between them, resulting in impractical solutions; while the consideration of only the economic criteria can overlook the environmental and social impacts of distribution activities, in the scope of sustainable supply chains. 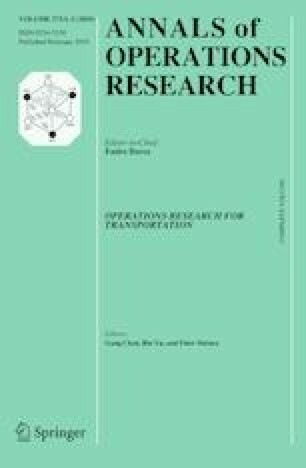 With the objective of improving distribution logistics, the aim of this review is to provide an overview of recent optimization developments for integrating packing and routing problems, in order to propose a simple classification scheme for re-aligning the optimization criteria and operational constraints, taking into consideration the issues of sustainability. Belloso, J., Juan, A. A., & Faulin, J. (2017). An iterative biased-randomized heuristic for the fleet size and mix vehicle-routing problem with backhauls. International Transactions in Operational Research, 1–13. https://doi.org/10.1111/itor.12379. Felipe, A., Ortuno, M. T., & Tirado, G. (2009b). The double traveling salesman problem with multiple stacks: A variable neighborhood search approach. Computers & Operations Research, 36(11), 2983–2993. https://doi.org/10.1016/j.cor.2009.01.015. Gonçalves, R. F., & de Queiroz, T. A. (2014). The knapsack problem with three practical constraints. In 2014 International conference on computational science (Vol. 29, pp. 2192–2200). https://doi.org/10.1016/j.procs.2014.05.204. Gonzalez, Y., Miranda, G., & Leon, C. (2016). Multi-objective multi-level filling evolutionary algorithm for the 3D cutting stock problem. In Knowledge-based and intelligent information & engineering systems: Proceedings of the 20th international conference Kes-2016 (Vol. 96, pp. 364–373). https://doi.org/10.1016/j.procs.2016.08.148. He, K., & Huang, W. (2010a). A caving degree based flake arrangement approach for the container loading problem. Computers & Industrial Engineering, 59(2), 344–351. https://doi.org/10.1016/j.cie.2010.05.007. Irnich, S., Toth, P., & Vigo, D. (2014). The family of vehicle routing problems. In P. Toth & D. Vigo (Eds. ), Vehicle routing: Problems, methods, and applications (2nd ed., pp. 1–33). MOS-SIAM Series on Optimization. https://doi.org/10.1137/1.9781611973594.ch1. Jozefowiez, N., Semet, T., & Talbi, E.-G. (2008). From single-objective to multi-objective vehicle routing problems: Motivations, case studies, and methods. In B. L. Golden, S. Raghavan, & E. A. Wasil (Eds. ), The vehicle routing problem: Latest advances and new challenges (pp. 445–471). New York: Springer. https://doi.org/10.1007/978-0-387-77778-8_20. Li, J., Lu, Q., & Fu, P. (2015). Carbon footprint management of road freight transport under the carbon emission trading mechanism. Mathematical Problems in Engineering, 13. https://doi.org/10.1155/2015/814527. Malapert, A., Guéret, C., & Jussien, N. (2008). Two-dimensional pickup and delivery routing problem with loading constraints. In CPAIOR’08 1st Workshop on Bin Packing and Placement Constraints (BPPC’08) (pp. 1–6). Retrieved from http://www.emn.fr/jussien/publications/CIRRELT-2008-37.pdf. Perboli, G., Gobbato, L., & Perfetti, F. (2014). Packing problems in transportation and supply chain: New problems and trends. In Transportation: Can we do more with less resources?—16th meeting of the Euro working group on transportation—Porto 2013 (Vol. 111, pp. 672–681). https://doi.org/10.1016/j.sbspro.2014.01.101. Sicilia, J. A., Royo, B., Larrode, E., & Fraile, A. (2014). A decision support system for a long-distance routing problem. based on the ant colony optimization metaheuristic. In Transportation: Can we do more with less resources?—16th Meeting of the Euro working group on transportation—Porto 2013 (Vol. 111, pp. 1035–1044). https://doi.org/10.1016/j.sbspro.2014.01.138. Vargas-Osorio, S., & Zuniga, C. (2016). A literature review on the pallet loading problem. Revista Digital Lampsakos, 15, 69–80. https://doi.org/10.21501/21454086.1790. Wang, L., Zhang, H., Xiong, Y., & Li, D. (2010). Ant colony optimization algorithm based on space division for container loading problem. In 2010 Chinese control and decision conference, Vols 1–5 (p. 3448–+). https://doi.org/10.1109/CCDC.2010.5498563.